I have this friend. She’s a wise and confident woman with many an opinion. Her view, articulated through crystal clear lenses, is always witty and makes me laugh (and think!). More than once she has managed to fit a crutch under me and uphold me as only a true girlfriend would do. I appreciate and love her more than words can say. Angela’s birthday seemed the perfect time to make this cake for her. So last summer I brought it to a little celebration in her honor, where a small group of girlfriends gathered on the patio to enjoy a beautiful Minnesota summer’s evening. Girlfriends, summer, tasty nibbles, wine, and a gorgeous layered cake…what more can a girl ask for?! The original cake recipe comes from Food & Wine magazine, and featured a cinnamon sponge cake. I thought the cake was good, but not exactly memorable. The frosting, on the other hand, was pure heaven. 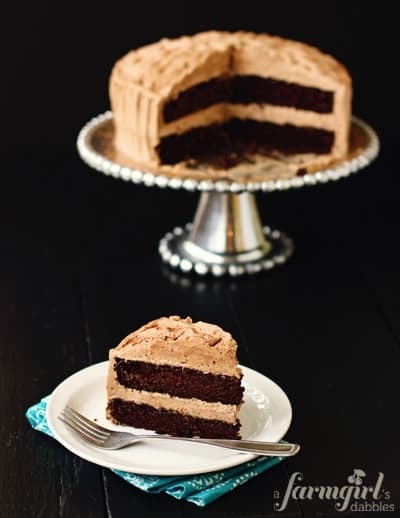 I have dreamt of that magnificent buttercream slathered over a deep dark chocolate cake ever since. So that’s what I did! 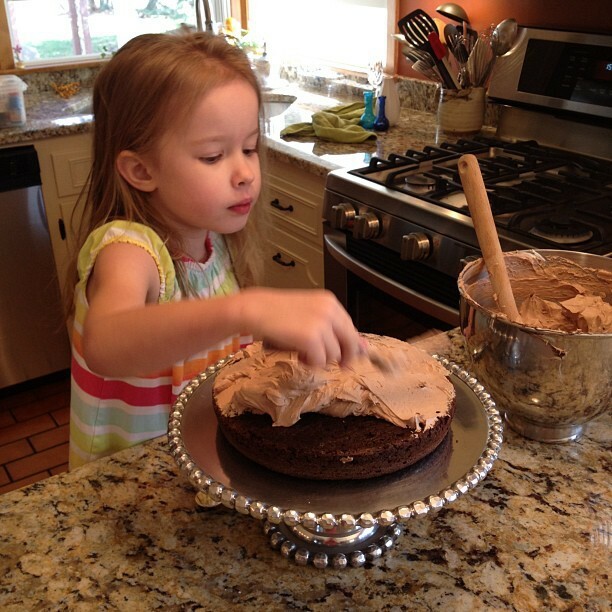 Tessa wanted in on the frosting action! 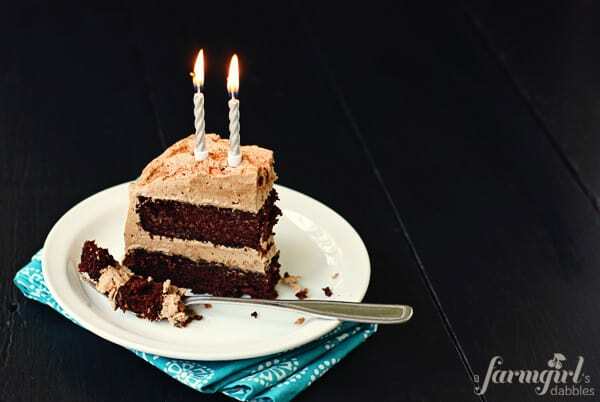 This Dark Chocolate Cake with Chile-Chocolate Buttercream is a layer cake to remember, for sure. At its core are two layers of that deliciously famous “Beatty’s Chocolate Cake”, found in Ina Garten’s Barefoot Contessa at Home. The cake is deep, dark, and super moist, and topped with some of the most wonderful buttercream I’ve ever set my fork to. 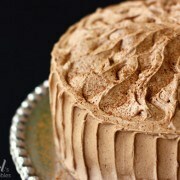 The frosting’s silky sweetness is complex, offset by the warmth of chiles and cinnamon. I love it! Although this cake would be spectacular served any time of year, I think it would a great addition to an upcoming Cinco de Mayo party. Let me know if you celebrate with it! Preheat oven to 350°. Butter two 9” round cake pans. Line with parchment paper, then butter and flour the pans. Sift the flour, sugar, cocoa, baking soda, baking powder, and salt into the bowl of an electric mixer fitted with a paddle attachment and mix on low speed until combined. In another bowl, combine the buttermilk, oil, eggs, and vanilla. With the mixer on low speed, slowly add the wet ingredients to the dry. With mixer still on low, slowly and carefully add the coffee and stir just to combine, scraping the bottom of the bowl with a rubber spatula. Pour the batter into the prepared pans and bake for about 35 minutes, or until a toothpick comes out clean. Cool in the pans for 30 minutes, then turn them out onto a cooling rack to cool completely. In a stand mixer fitted with a paddle, beat the butter until creamy. At low speed, beat in the powdered sugar. Increase the speed to high and beat until fluffy, scraping down the side of the bowl, about 2 minutes longer. At low speed, beat in the cream, vanilla, cinnamon, ancho chile powder and cayenne, then gradually beat in the cooled bittersweet and white chocolate. Scrape down the side of the bowl and the paddle, increase the speed to medium-high and beat until light, 3 minutes longer. Using a wooden spoon, vigorously beat the buttercream for 30 seconds to deflate any air bubbles. Place one cake layer, flat side up, on a plate or cake pedestal. 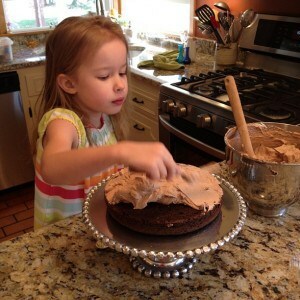 With a knife or offset spatula, spread the top with almost 2 cups of the frosting. Place the second layer on top, rounded side up, and spread the remaining frosting onto the top and sides of the cake. (There is plenty of frosting and I’ve never used all of it.) Lightly dust the top of the cake with additional cinnamon. So pretty! Refrigerate the cake for at least 30 minutes before slicing. If the cake has been fully refrigerated (many hours or overnight) prior to serving, be sure to bring it to room temperature before serving, which can take 30 minutes or more. 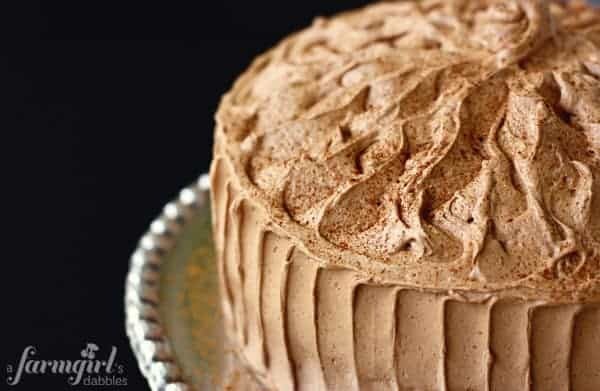 This cake can easily be made the day prior to serving it and any leftover cake keeps well when covered and refrigerated. Dark Chocolate Cake slightly adapted from “Beatty’s Chocolate Cake” from Barefoot Contessa at Home. We are also celebrating a little birthday of our own here, completely honored and awed with the fact that a farmgirl’s dabbles will be 2 in just a few days. Wow! We are so very thankful to all of you for reading and connecting with us, and sharing in all the yumminess. And we’d like to give you the chance to win 1 of 2 gift cards, in appreciation. If your name is chosen, you will receive one $50 gift card to the store of your choice! Williams-Sonoma, Target, Crate & Barrel, or Amazon…it’s completely up to YOU! The winners were Mary and Jan, who have each received their prizes. Leave a comment below, letting me know what food related item(s) you would get with one of these gift cards. The fine print: Contest ends Monday, April 30th at 6:00 pm CST. Open to US residents 18 and older. Two winners will be chosen via random draw and notified by email. Winners will have 48 hours to reply and claim their prize or another winner(s) will be chosen. a farmgirl’s dabbles is not responsible for lost or undelivered emails. Disclosure: Prizes offered and paid for by a farmgirl’s dabbles, in appreciation of our readers.